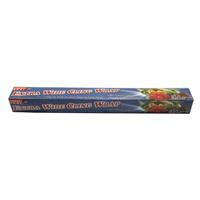 "Wholesale EXTRA WIDE CLING WRAP 18" X50' Use to wrap or cover food to keep fresh. Microwave safe. Handles all environments. Clings to metal, glass, trays and itself. Handy cutter included. " 9.06" x 18.90" x 12.99"